I am very grateful for the Klemsia clamps from Dietrich Kessler’s legacy which the RAB Trust kindly passed on to me. They work brilliantly and I find them extremely useful, as they are so easily and quickly adjustable making it an absolute pleasure to work with them. I am currently in Second Year (repair and restoration) at Newark Violin Making School. I enjoy the variety of subjects we have to deal with this year although it is quite a challenge to organise them alongside each other. There are various repairs to do, varnishing and setting up of previously made instruments, bow rehairing, and the making of more instruments. All in all, a lot of work, a lot of new things to learn and a lot of fun! 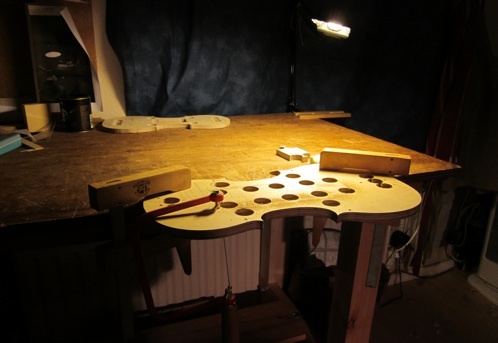 The picture shows the clamps in action: I am cutting out the middle part of the mould for the viola I am making this year.